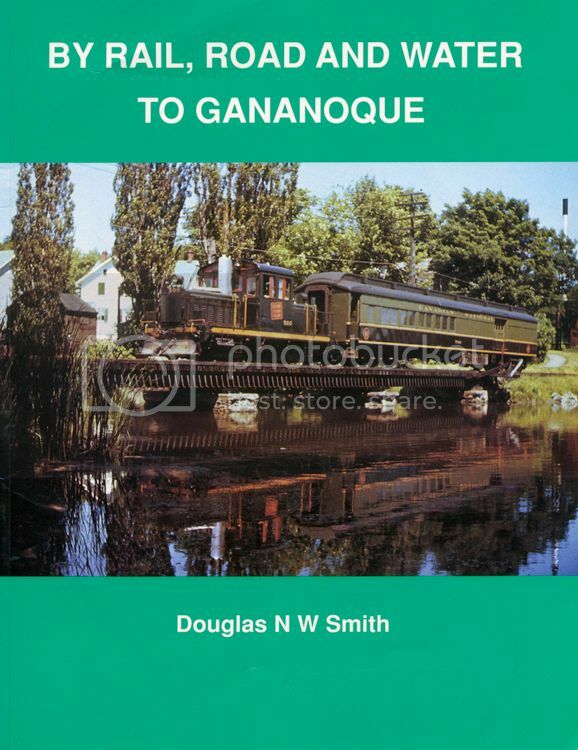 Here’s another in an occasional series of ideas for achievable layouts – especially in the larger scales, such as S.
The Thousand Islands Railway ran a few miles from a junction with the Canadian National’s Montréal-Toronto mainline, south to the town of Gananoque* in eastern Ontario. Along the way it crossed the Gananoque River a few times, and terminated on the north shore of the St. Lawrence River. Of particular note is the motive power used on the line. It had to be small, so unique steam and diesel locomotives were deployed – including TIR 500, the diminutive centrecab most commonly associated with the line. In the 1930s, the line ran seven round trips daily (four on Sunday) between town and junction. The schedule then started a slow decline from that peak, but passenger trains still ran until 1962. This contains a wealth of information about the railway, including several track maps and information about passenger service and freight customers. For example, a 1947 map of the Gananoque terminal shows a nine-switch track arrangement, serving a coal/wood yard, a second coal dealer, a number company, a mill, the Cow and Gate dairy, a two-stall engine house, a passenger station and adjacent freight/express building. The terminal is laid out along the waterfront, including a ferry ticket booth and wharf. Another map – from 1927 – shows more of the trackage through the town, providing the modeller with plenty of material to get started. At one time, Jackie McNeil of Gananoque offered an HO scale set of etchings for TIR 500. I have a set of his etches for a GE 25 Ton end-cab loco in S scale, but I’m not sure if he ever offered the TIR 500 in 1:64. Regardless, Jackie wrote an article about building his HO scale model, which appeared in the May 1997 issue of Model Railroader magazine. This article includes etching templates for those wishing to create their own model, in any scale. 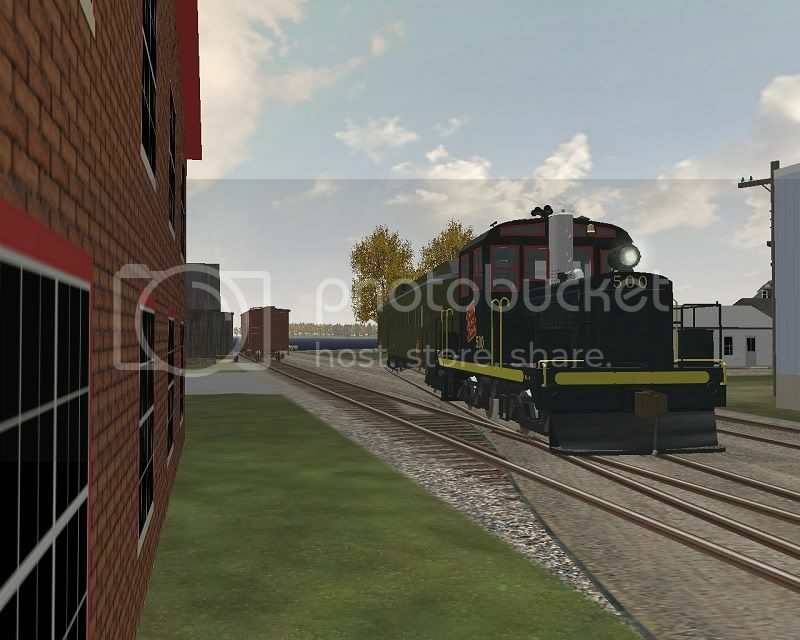 Of course, one could substitute any small locomotive such as a GE 44 Tonner from Dan Navarre at River Raisin Models, a GE 44 Tonner or 70 Tonner from Jim King at Smoky Mountain Model Works. 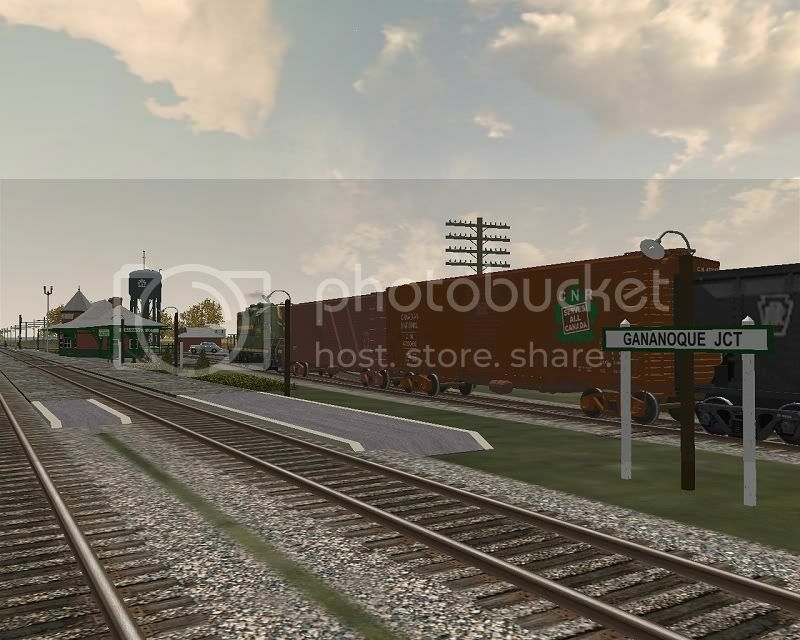 Operation would be similar to what I’m doing on my layout – running a single train at a time to serve the passenger and freight traffic in small-town Ontario – with the added advantage of actually having a waterfront to model! This entry was posted in Prototype Inspiration by Trevor. Bookmark the permalink. Great suggestion Trevor. Moving a little further up the Great Lakes there’s also the Kingston Subdivision, which ran 2.2 miles from the mainline to the waterfront at Kingston. It includes a crossing of, tracks parallel to and joint section with C.P.R and several industrial tracks including the Canadian Locomotive Company. Further infomation in Gordon D. Smithson’s book “At The Bend In The Road—Kingston” (Amherstview, 2000) ISBN 0-9694916-1-1. Thanks for the follow-up. I haven’t heard of Gordon Smithson’s book – it’s always great to discover something new like this. The brick house in the picture behind the crane is where my new townhouse is, we are right beside it. I can’t seem to get away from Railways! Notice how close the CN mainline is. This would make an interesting model as every engine CLC made had to travel up these spur lines. Moving further East there is the Brockville and Westport as well. There was a daily mixed train on this line handled by small 10 Wheelers and E 10 Moguls. Westport is a very simple terminal as well, 6 switches. Despite this is was busy as it saw a second mixed train every day as well. This was the Brockville/Napanee mix that ran every other day along the former Canadian Northern mainline to Ottawa to Forfar where it switched over to the B&W. According to schedules it travelled to Westport every day till the line to Westport was abandoned. Farm country but also Canadian Shield rock, especially around Newboro where there is a lock on the Rideau Canal, a girder bridge and a Blockhouse. All very scenic. There are some interesting yet simple lines out there. Trevor, this is a great little railway and Smith’s book is a wonderful introduction to this line. There are modelgenic scenes all through the downtown beyond the terminal. Tracks beside power canals, swing bridges, a track over a power canal on a curved trestle, stone factories, brick factories, a switch on a trestle, power plants, dams, weirs, passenger shelters at railway crossings, different bridges, cattle docks. coal yards, a boat builder, the list goes on. 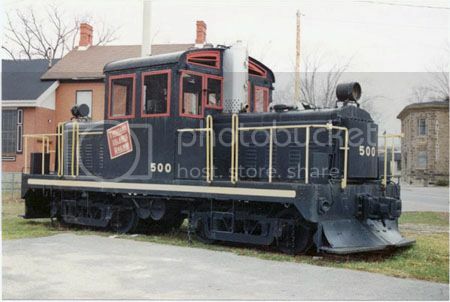 You mentioned the motive power as well but the line did use an S-3 at the end, and small steam was used to power the line in emergency situations even after it was dieselized with 500 and CN’s #77, another early diesel. They even tried to use a gas electric car. Steam during the 20’s and 30’s was former Grand Trunk commuter tank engines. During the 70’s I played many concerts at the bandshell in town and at that time CN was using RS 18’s and GP9’s to switch the Stelco Rivet plant. The power canal south of Hwy 2 was what limited the engines that could work this line and after this portion was abandoned there were no major load limits. The rest of the line was abandoned in the late 80’s I believe. Yes this is an interesting line. One neat operational detail was that the line received two LCL cars every day, one from Montreal and one from Toronto. They would take these cars to each industry and off load the goods directly to the customer, sometimes they also picked up if a shippment was ready to go. What was left over was taken to the brick freight house behind the Tudor style station with some of the tracks in cut grass, as in lawns! As soon as CN dissolved the TI, because of tax issues, this service was replaced with trucks! #500, locally known as “Susan Push”, is plinthed in Gan., http://www.flickr.com/photos/snuffy/538969983/. I remember walking this line sometime prior to abandonment. The state of the track was such that only the presence of an obviously in-service car would make one believe that anything could traverse it. It was by then clearly one of those “1 mile per, 1 guy watching the lead wheels from each side” operations. That would certainly be one way to stretch out an operating session, hmm? And it looks like they have turned the line into a trail that google maps shows as going all the way to the CNR mainline at Gananoque Junction. Will have to drag the kids + dog there next time we are in Kingston with clement weather. Great article and I agree that the TIRR would make a great little layout. In 2001 I had the chance to spend an evening walking the line and exploring the area. Everything was very photogenic and as a plus for the modeller, very compact. I posted a few photos from my trip that I found on my own blog – not sure if it helps.